We generally think of comets and asteroids as two distinct types of bodies. Comets are “dirty snowballs” of mostly ice, which vaporizes to form long tails when they approach the Sun, while asteroids are dry, rocky bodies that typically live in the asteroid belt. It is generally true that comets tend to have an icy surface of volatiles that can evaporate off its surface, and asteroids generally don’t. But it also turns out that the two are far more similar than they are different.The idea of comets as dirty snowballs isn’t very accurate. For one thing, asteroids and comets are both rocky bodies, although asteroids can also contain large amounts of metals. Long period comets, originating from the Oort cloud, can have significant ice, and are closer to the traditional view of comets. 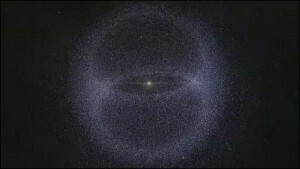 Short period comets often have much of their ice evaporated away, so that they look more like asteroids. Asteroids can also have pockets of ice beneath their surface. As these pockets are exposed to sunlight they can create comet-like streams. Another way to distinguish comets is by their orbits. Comets tend to have more elliptical orbits, while asteroids tend to have more circular ones. This can be summarized in a quantity known as the Tisserand parameter, which is a measure of a body’s orbital size and eccentricity compared to the orbit of Jupiter. A Tisserand parameter between 2 -3 usually means an object is a comet, while a value greater than 3 tends to be an asteroid. But there are also object that seem to cross the line between comet and asteroid. For example, an object known as P/2013 P5 has an asteroid like orbit and composition, but was observed to have six comet-like tails. Or consider the object known as Ceres. It is now considered a dwarf planet, but was once considered to be an asteroid. It has an asteroid object, and is both rocky and metallic. It also has water vapor plumes, and even a faint atmosphere derived from the water vapor. Ceres is a large asteroid with faint comet-like plumes. As we learn more of both asteroids and comets, we find they are just two types of a range of small solar system bodies. I’ve started thinking of the word “comet” as more of a verb than a noun. When a small solar system body starts expelling significant amounts of gas and dust, it is cometing. Objects with more eccentric orbits that pass closer to the Sun will comet more than those with more circular orbits in the asteroid belt.